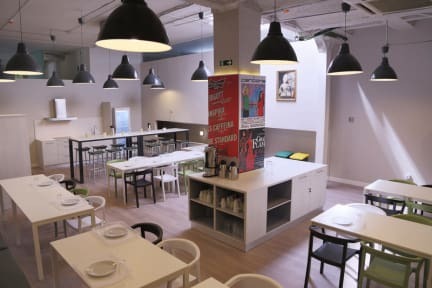 The lively and brand new Hola Hostal Eixample is set in Barcelona's Eixample District, less than 10min walking to PlazaCatalunya. This property has a 24-hour reception, bed linen and Wi-Fi access for free. Breakfast is included from 7am to 9am. Rooms and beds are spacious and air conditioned. The property offers free luggage locker. All air-conditioned bedrooms feature a stylish decor. It has a large terrace and is equipped with a flat-screen TV in the living room. There is a cafe-bar next to the hostel, and several shops and restaurants can be found in the vicinity. Glòries shopping centre including a Carrefour supermarket is 15 minutes walk away. The city s famous Sagrada Família Basilica is just 10 minutes walk away. Plaza Catalunya can be reached in about 20 minutes on foot, and the hostel are just 10 minutes walk from the trendy Born district. Tetuan Metro Station servicing line 2 is 400 metres away, and Estació del Nord Bus Station is a 5-minute walk away. Cancellations are only accepted via email. Late cancellations and no-shows shall incur a charge equivalent to the first night accommodation to the credit card used at booking. Check-in time : 14.00 pm. Check-out time : 11.00 am. Reception 24h so you can arrive at any time. 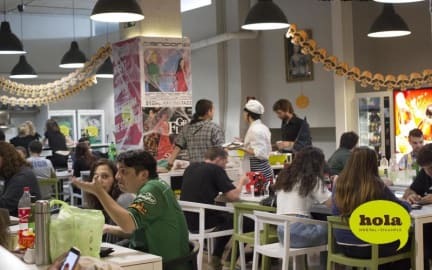 The hostel is wonderfully located at the Eixample neighborhood, a very vibrant and young area with the best vibe. The staff was very suportive and friendly. The pubcrawl was excelent, I really enjoyed meeting and parting together with Paulinho, Felipe, Nati, a wonderful thing that shaped entirely to the best my experience in Barcelona! I really felt in love with the city and this hostel and this people were of a key importance for that! Sure I would came back. Hola Hostel BCN was a good place to stay for a short trip! If you were doing a long stay, I would look for another place, but for a weekend it is perfect. The staff was super helpful and attentive. The free breakfast is also a great reason to stay! As far as cleanliness, the rooms were clean, but the shower room was not the cleanest due to mold. Overall this was a good place to stay for my weekend trip! The location is good and the staff is friendly. The way the bathroom were set up was a little odd. I did like the simplicity of the lockers with the key cards and how big they were. Comfortable, quiet place to come back to after a long day out. Bed is too soft for me but it's still ok. Breakfast was simple. Love the shower. It's a 20 minute walk to the main attractions at the centre but along the way there are many things to discover like cafes, bars neighbourhoods. Messed up my reservation. They claimed I overstayed my reservation and demanded I pay 20 euros to stay another night. This was false and I refused to pay. Finally, the desk person gave in and let me stay after showing my receipt and my confirmation email. Unprofessional, will never stay here again. The rooms were hot and humid the entire time. Uncomfortable sleep. Considering the mark they had on the website, l expected a much better hostel. I chose also because of the breakfast, but it was not worst it at all. Keep in mind it's served from 7 to 9 only. Finally, the staff was incredibly rude!! In special one guy during his night shift who refused to help me order food, told me to go to the supermarket alone at 3am and didn't let me eat the stuff I bought in the common area when l returned. I was, silent, polite, didn't understand why I was mistreated.